The problem with manias (a bid for risk assets) is that it starts small and evolves into a monster where people borrow money to buy these risk assets in hopes of hitting the lottery. 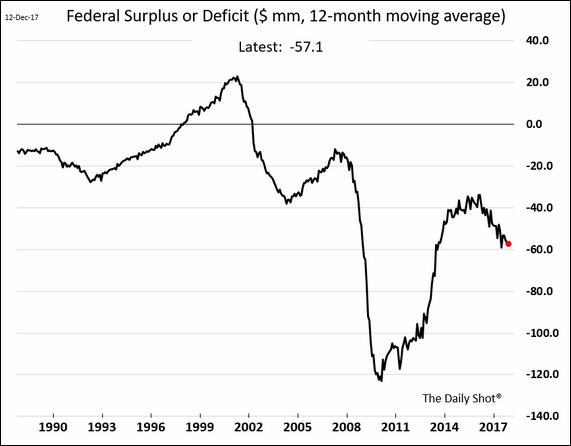 This was also prevalent with real estate and mortgage lending in the 2000-2007 period which led to a crash in 2008. And now we are seeing signs of this behavior again with another new risk asset – cryptocurrencies. Could we be this stupid, again? Yes, yes we can. 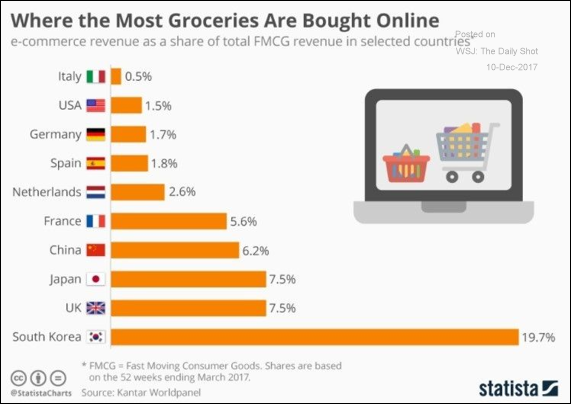 Online purchases of groceries for select countries. Core CPI (inflation measure) rose 0.1%M in November, lowering the year/year rate to 1.7% from 1.8%. With food flat and energy up 3.9%, headline CPI rose 0.4%, raising the year/year rate to 2.2% from 2.0%. Retail sales came in much stronger than expected in November, with headline retail sales climbing 0.8% compared to both our expectation and the consensus estimate of a 0.3% rise. Gains in November were broad-based, with retail sales increasing in all but two of thirteen major categories. The strongest gains were seen in gas stations (+2.8%), non-store retailers (+2.5%), electronics (+2.1%), furniture (+1.2%), and building materials (+1.2%). The Governing Council of the European Central Bank (ECB) decided not to change its monetary policy this week keeping zero interest rates and its quantitative easing program. The Governing Council said it is expecting key ECB interest rates to remain at their current levels for an extended period of time. Interest rates on the main refinancing operations, the marginal lending facilities and the deposit facility will remain at 0.00 percent, 0.25 percent and -0.40 percent, respectively. In October, the ECB announced it will extend its quantitative easing program in the eurozone until September 2018 at a monthly purchasing rate of 30 billion euros ($35.4 billion), down from monthly purchases of 60 billion euros. 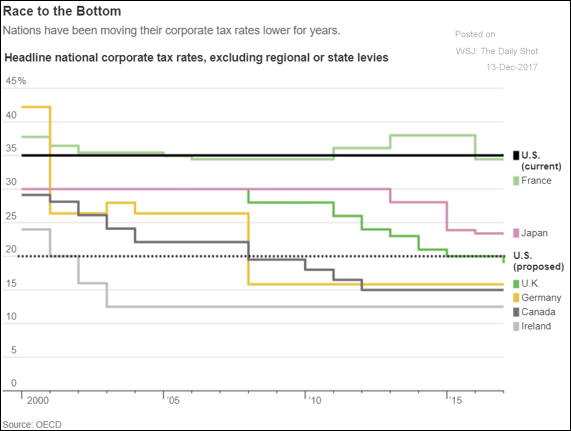 This chart is a bit dated but it gives you an idea of how the rest of the world has passed by the United States in terms of tax rate competitiveness. Scott Cutler, senior vice president of eBay Americas, told Yahoo Finance that the e-commerce giant is holding serious discussions about becoming the highest-profile company to accept cryptocurrency payments. U.S. President Donald Trump has signed a $700 billion military spending bill that includes a mandate for a blockchain cybersecurity research study. Blockchain is used with cryptocurrencies as a means to settle transactions. One has to be careful when comparing the Bitcoin market cap with other assets. 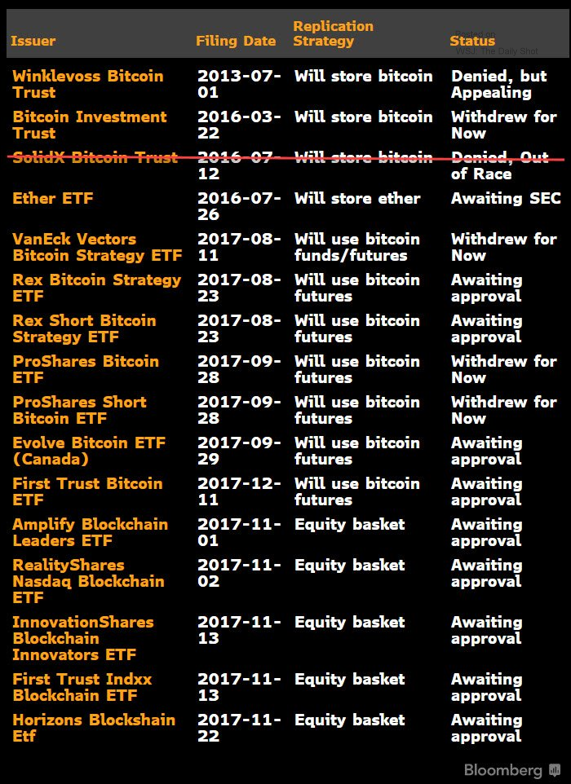 Ready for that Bitcoin ETF? How about a bunch of them? (WSJ) These ETFs below are in the pipeline and will likely be hitting the market in the coming months. 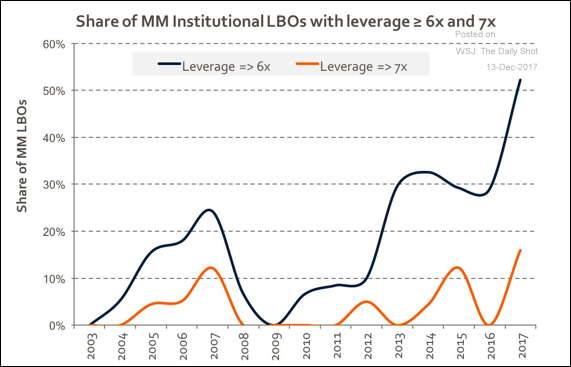 The proportion of high-leverage LBO deals hit a record this year. 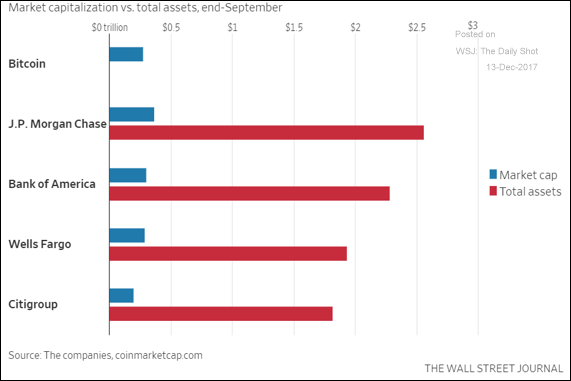 (WSJ) This type of leverage is quite high and is indicative of late-cycle activity. Still a low default rate in junk date so this train is still rolling along into 2018. The U.S. Securities and Exchange Commission (SEC) Chairman Jay Clayton issued a public statement on cryptocurrencies and Initial Coin Offerings (ICOs), providing blockchain startups and ICO investors with the most in-depth look into the SEC’s stance on this fundraising model. Chairman Clayton stated: “A number of concerns have been raised regarding the cryptocurrency and ICO markets as there is substantially less investor protection than in our traditional securities markets, with correspondingly greater opportunities for fraud and manipulation. By and large, the structures of Initial Coin Offerings that I have seen promoted involve the offer and sale of securities and directly implicate the securities registration requirements and other investor protection provisions of our federal securities laws”. This may mean that the SEC will look to regulate this industry in some way in the near future. Will this shut-down ICO activity in the United States? Maybe, but cryptocurrencies aren’t bound by borders so I am not sure how the SEC will exercise their jurisdiction. Why someone would voluntarily seek out bitcoin’s gyrations might not be obvious. In an era where firms are desperate for something that moves, bitcoin fulfills that quest. Trading on a futures exchange promises all the excitement within the sturdy walls of a regulated venue for bitcoin and other futures contracts. CBOE rival CME Group will debut its own bitcoin futures Monday. (FT) As an example, the price of Corn, according to this chart, can move as much as 20% in one year. 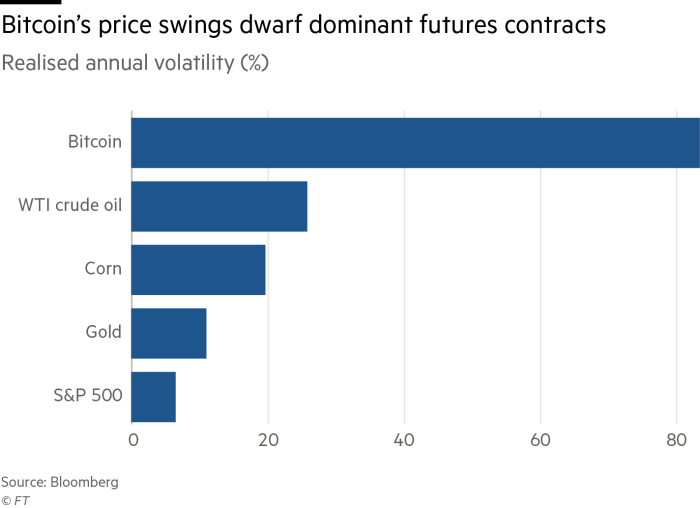 So you can see that bitcoin has 4x the volatility of 8x the volatility of the S&P 500. Volatility swings both ways so volatility measures how much you can be UP or DOWN in a given time period. Clearly, bitcoin trades with its own volatility regime. 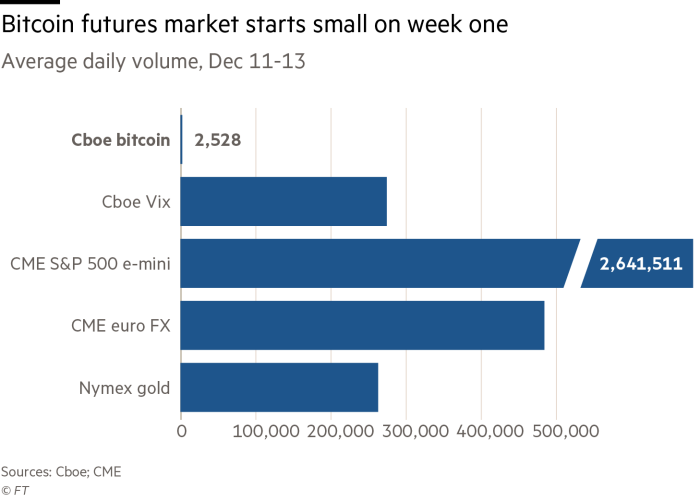 Bitcoin is new to trading on the futures exchange but that is likely to change in the coming months. Here is a chart on trading activity measured in terms of contracts traded. Small in comparison to other products so let’s see how this evolves in the coming months. The South Korean government held an emergency meeting to evaluate the state of the local cryptocurrency exchange market and trading of cryptocurrencies, according to Fortune. The South Korean central bank stated that the government plans to introduce various regulatory measures. South Korean regulators have also allegedly announced a plan to ban banks from activities involving cryptocurrencies, prompting major banks in the country to declare they will no longer issue accounts required for crypto trading. South Korea’s top Bitcoin exchanges are all affected, including Bithumb,Coinone, and Korbit. The Banks that have made announcements are Shinhan Bank, Korea Development Bank, and Industrial Bank of Korea. Retail investors pay 15% – 25% premiums to get access to the cryptocurrency market in South Korea. Some are said to be betting their whole savings in this market. Bitcoin buyers have been issued a “serious warning” from one of Britain’s leading financial regulators. “If you want to invest in bitcoin, be prepared to lose all your money,” Financial Conduct Authority CEO Andrew Bailey told BBC’s Newsnight. He added that a lack of backing from governments and central banks, as well as similar risks to gambling, are evidence that the cryptocurrency is not a secure investment. That is all for now until next week’s Market Update. If someone forwarded you a copy of this report, you can sign-up directly at www.kiscocap.com. Please reach out to me if there is anything you want to discuss about the markets, your portfolio (for clients) or if you would like a copy of the firm’s brochure if you are not a client. Mr. McCarthy is the President and founder of Kisco Capital. © 2018 Kisco Capital, LLC. All Rights Reserved.